In the fifth module of the BRMP training from ITSM Zone I was introduced to Business Transition Management. One of the things we tend to forget, whether it is from a project or operational standpoint, is the people factor. Business Transformation Management addresses that very concept. It deals directly with handling the communication, stakeholders and any potential resistance that might be met along the way as a result of new changes that might be introduced. If you’re thinking that this sounds like organizational change management, you might be on the right track. The main difference here is that the focus is on the business partners and the transition that they will need to make, thus Business Transition Management. 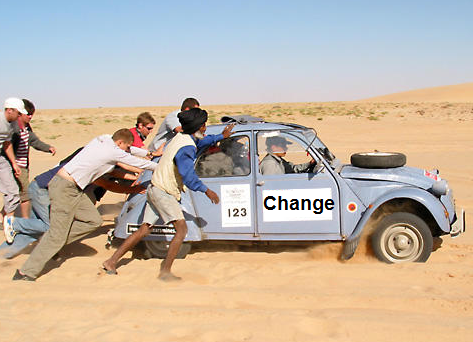 As many people will probably tell you the most challenging piece of any change is the people component. In every group there is going to someone who is adverse to change. So what is the best way to get them to buy-in to what we are doing? In my experience I like to look at this from the other angle. I find that while some people may have difficulty with change, they are far more likely to avoid any type of pain than anything else. This is where the verbiage in the discussion with the business is important. Outlining what we will gain as well as what challenges we will see if we do not act on this particular business initiative is going to nudge those who may on the fence. We need to speak in terms that the audience will clearly understand in their business language. While this is only the beginning we need to start with a foundation. Actions speak louder than words so while we may talk a good game we will need to prove that we are capable of executing. Now that we have put down the foundation, communicated our intentions and delivered on some initial changes, we need to keep the momentum going. To be successful we need to reiterate the sense of urgency in the change that we are making. Regular communications with all stakeholders is critical. This will ensure that all people are informed on the progress as well as what is coming up next. This is the ‘management’ part of business transformation management. In essence this module reinforced that we need to manage all change activities with the business. In my own experiences I have seen where not following through takes a solid start to a sputtering finish.